More brilliance from The Onion. Of the $368 billion marketers plan to spend this year, 32.5% will go toward digital; 30.3% to print. Digital spending includes e-mail, video advertising, display ads and search marketing. “It’s a watershed moment,” says the study’s lead author, Outsell vice president Chuck Richard. The internet has surpassed newspapers and radio in popularity as a news platform on a typical day and now ranks just behind TV. The average online consumer regularly turns to only a few websites. News is pocket-sized. Some 80% of American adults have cell phones today, and 37% of them go online from their phones. News is personalized: The “Daily Me” takes shape. Feeling curmudgeonly today. I agree with every point David Schneiderman makes here, but I don’t like it one bit. His conclusions prove that revolutions do not equal progress, and technological advances are separate from quality improvements. In the case of the Internet spelling the death of newspapers, technology is accelerating the arrival of the lowest common denominator in news and information: tabloid-style “journalism” and opinion undifferentiated from news, delivered not by institutions with time-tested credibility but by news celebrities with personal brands who can gain prominence virtually overnight, particularly if they are edgy and sensational. It’s a good read, though, and a useful primer on the information revolution. This is just horrifying beyond words. A suburban school district near Philadelphia issues students computers equipped with webcams. The students’ MacBook laptops were outfitted with management software called LANrev that could be used to remotely activate the Webcams. The district has characterized the technology as a security tracking feature intended to recover lost laptops, and has reported that the software had been used for this purpose 42 times as of Feb. 19. Someone using this technology activates the webcam of young Blake Robbins while he is in his bedroom at home. The assistant principal confronts Blake,16, with a photo and accuses him of selling drugs. It later turns out that the capsules in the photo are Mike & Ike candies. Of course, the assistant principal and the district are denying everything, but as Blake points out, the denials fall short. Parents and students in the district are agitated. They report that students keep their computers with them all the time, including when they are changing clothes, sleeping, and even showering, so that they can listen to music. The FBI is investigating, and the ACLU has entered the case, saying the photo constitutes an illegal search. Lawyers for the family have sought an injunction to prevent the district from deleting evidence from its computers. I wonder if the school district teaches George Orwell’s classic. Or did they drop it down the memory hole when its content became too uncomfortable in this post-1984 world? 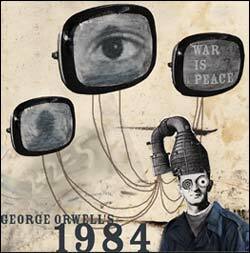 UPDATE: A sophomore at the high school reported that his class had just read 1984. Lets hope it is required reading for administrators from now on. Jay Rosen of NYU poses an excellent question about the state of journalism, based on David Barstow’s reporting in The NYT last week about the Tea Party Movement: Is it enough to report the expressed beliefs of the movement without examining the reality of those beliefs? Like Morris, however, I am a Southerner. What he points out is true: Some Americans, largely concentrated in the South, are expressing what for them IS a reality and not a paranoid fantasy. The feel an absolute right to use tobacco, fly the flag of the Confederacy, refuse to buy health insurance, keep unions out, pretend gays don’t exist in the military, and so on. That’s liberty for them, and it’s being assaulted on many sides, as they see it. Rosen rails against “perception is reality” as a cop-out. For him, there is an objective reality, and the news media have a duty to report departures from it. But Morris’ point is equally valid: For some of these folks, “impending tyranny” is reality, and their perceptions affirm it. So, I think Barstow plays it nearly right, and Rosen, too. Rosen says he wishes Barstow’s piece were even longer. Me, too. I disagree that he should declare the Tea Party beliefs to be irrational and delusional. But I think he should have illuminated those beliefs in more detail, challenged their proponents to back up their charges, and let the readers decide for themselves. Finally, I’m not sure the current state of the media represents a low point, as Rosen apparently believes. It can get better. Remember that most of the media reported only the horse-race aspects of Joseph McCarthy’s House Committee on Un-American Activities for four years before Edward R. Murrow finally had the guts to examine the facts of it, which shut McCarthy down in a matter of days. Forgive the USA-Today-style headline, but a new report from Nielsen on attitudes toward paid Internet content may offer some hope for a revenue stream for online news providers. Nielsen surveyed 27,000 across 52 countries. The survey showed that about four out of 10 consumers would consider paying for online newspapers, and one in three would consider paying for Internet-only news sources. 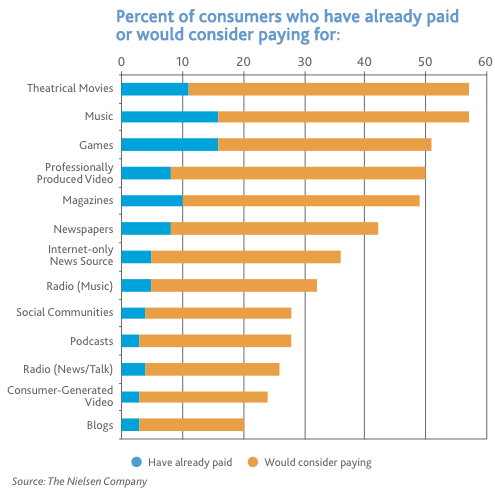 Nearly half would consider paying for magazine content online. Those numbers may sound unexciting, but consider that news consumers probably make up a modest portion of the general consuming public Nielsen surveyed. It indicates that there is at least a market for pay-for-content in news, though maybe a reluctant one.